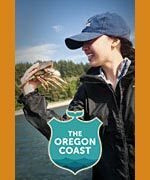 (Oregon Coast) – Much of the pleasures of visiting the Oregon coast involve finding some really fascinating beach you never knew about. Especially when it appears no one else knows about it too. You can sort of claim it as your own. 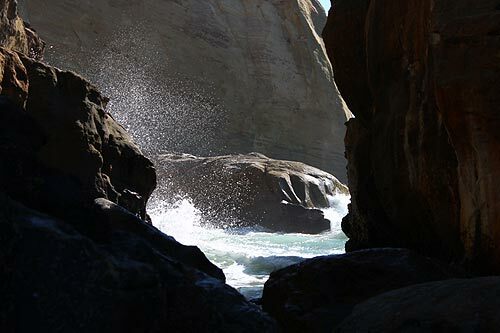 (Above: the oceanic canyon at Cape Kiwanda). 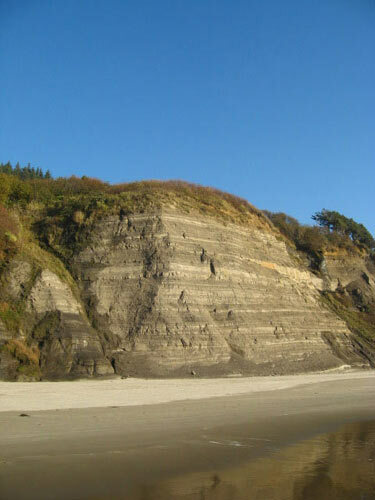 Numerous such places do exist on the Oregon coast – little destinations that are big on discoveries. 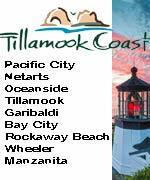 Three examples lurk in the areas around Cannon Beach, Yachats and Cape Kiwanda. If you blink you'll miss it. Approximately one mile north of Pacific City, and a tad shy of Tierra Del Mar, there's a tiny unmarked road zipping off into the brush towards the ocean. It appears to have no name. No designation from the road. But it's still technically part of the vast Cape Kiwanda State Park – and actually known as McPhillips Beach. This is a treasure trove of fun and funky stuff, including bundles of basalt wonders near the beach entrance. It's also one of the few sandy areas where you can drive your car – for better or for worse – but this does come in handy to go south almost a mile to hit the mysterious northern edge of Cape Kiwanda. There's lots to see and gawk at here, including the awe-inspiring ocean canyon that sits tucked away from any other vantage point. You can also drive one mile north of the entrance into Tierra Del Mar. More on that spot at the Three Capes, Oceanside, Pacific City Virtual Tour, Map. 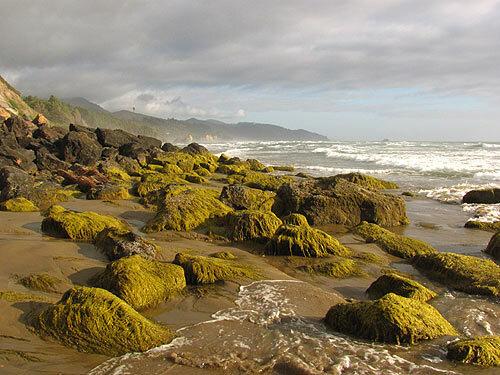 Yachats seems chock full of secrets hiding in plain sight, with dozens of intriguing pocket beaches lurking in between the massive basalt blobs and slabs that make up most of the area. 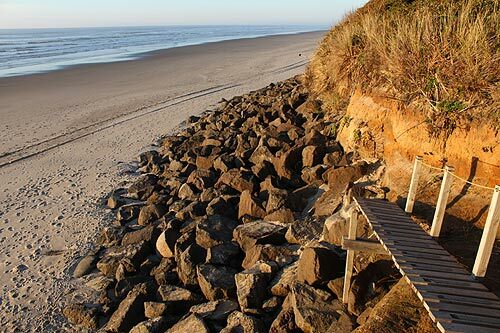 Yet there are chunks of Yachats that are rather unknown – and crazier still – all broad, sandy beaches much like those in Waldport to the north. At the town's extreme northern edges, look for Milepost 161 and a host of streets named after states. This is a residential neighborhood, so take great care when parking or traversing these tiny roads. Turn into Oregon St. and you'll run into a fascinating little beach access that's a bit like a tunnel. Or wander north a few blocks and find others, like the one with a sort of suspension bridge that hugs the cliffs and reminds one of something out of the Swiss Family Robinson flick. Around here, there's often not another soul. 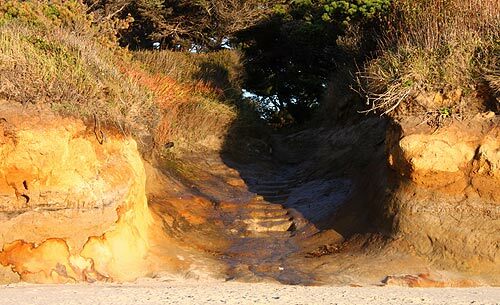 Soft sands are bordered by sandstone cliffs that light up to a vibrant gold on sunset days, and these features sometimes curve inward into engaging cove-like structures. Other beach treasures often abound here because there's usually not very many to pick the area clean. More on this at the Yachats, Oregon Virtual Tour, Map. 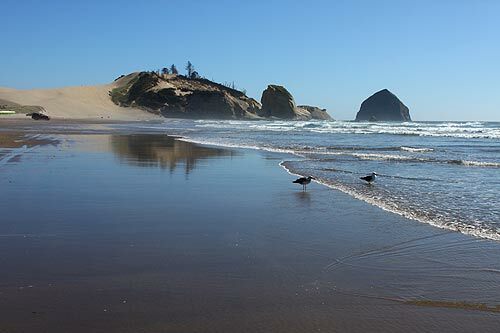 Finally, believe it or not, there's way more to Cannon Beach than the miles of sand accessible from Tolovana, into Midtown and Haystack Rock, or at its northern edge by Ecola Creek. Head to the very southern edge, just before the town dead-ends into Highway 101, and there are a couple of hidden beach accesses between homes on these diminutive streets. Hit the sands from here and walk southward, perhaps a quarter mile, and you'll reach those engaging rock structures beneath Silver Point – one of the main viewpoints just south of town. Here is a wonderland full of unique sights. Popular with surfers, you'll encounter cliffs with odd horizontal lines on them, as if something from the ice age had carved its rocky signatures into the face. 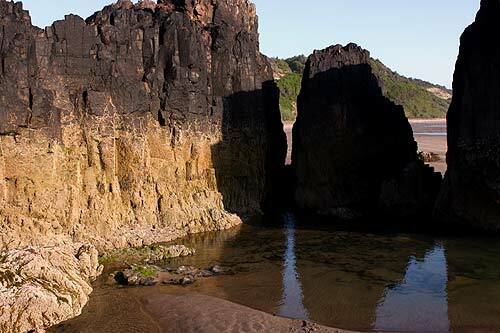 A sea cave is sometimes visible in the big blob rock at the tide line – but not accessible. Even more intriguing are the small rock chunks poking up out of the sand (depending on sand levels), and these are often covered in slimy sea algae goo that gives them a hairy appearance. It makes them look like a small herd of Cousin It's – from the Addams Family. You can keep walking south from here and you'll encounter the edge of Arcadia State Park. 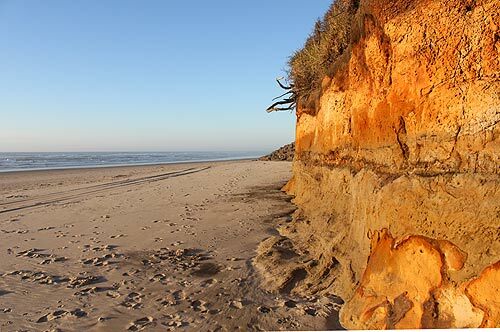 Even more about this spot and its intriguing sights and geology at the Cannon Beach Virtual Tour, Map and at North Oregon Coast Cliff Face Speaks Volumes of Geologic History.